Sorrow padded through the forest, each step she took light and cautious, ears perked forward and eyes scanning the area. She knew she was in a pack's territory, probably quite close to their den area, by the strong smell of many wolves. She didn't mean to trespass, but she had been wondering what life in a pack was like, never having been in one truly, and had went and searched for one. The striped she-wolf hoped she wasn't going to get attacked by the wolves of the pack. Sorrow heard voices through the trees and stopped, head lowered towards the ground, rethinking her decision. Should she turn back now? What if they thought she was a monster? What if they tried to kill her? All these thoughts and more ran through her mind, and she started to turn back the way she came when Dean, who had been walking beside her quietly the whole time, as she instructed, suddenly bolted towards the voices without warning. She swung back around and padded after him, much quicker and frantic then before, making sure he didn't get into trouble. As the group of wolves came into view she slowed, ears pinning against her head and body lowering in a sign of submission, seeing Dean pounce, in a playful manner, onto the paw of a rather dominant looking wolf with black and white fur. She muttered softly, like a whisper, and the cub looked over at her for a moment before looking around, finally noticing where he was, and bolted over to Sorrow, hiding underneath her. Sorrow gave an apologetic smile, hesitant and shy, and spoke. "Hello, we don't mean to trespass, or anything, but we were looking for a pack to join. My name is Sorrow, and the cub is named Dean." She said, voice quiet, awaiting whatever fate awaited for her, whether it be acceptance or beating. The male's chest became heavy with anxiety when the scent of another pack first greeted his nose. The border was close, and the moment he had been waiting for was due to come. The wolf planned to meet this pack, join its ranks. He had heard many stories about their powers... the dark forces he could also wield himself. Yes, the power of persuasion. How lucky he was to have been born with the gift from the heavens. Not only did it lead him to power, but lead him down a new path to godliness. No wolf could refuse his voice of reason. When he finally found the threshold, heavily marked by the scents of an alpha, he decided it would be best to wait. Of course, he would not want to be on bad terms with the pack he was to join. But he would not allow them to think him weak, so when he bellowed a howl into the sky, he made sure it was pristine and loud. His power was not to be taken lightly. addressed: The one who comes to accept me to the pack whoever that may be. Notes: How do you do the lovely boxes around your posts and words that I see in other topics? Nova nodded to Ross saying as he left," The Alpha's are at the river right now. I will meet you there shortly." He turned to the others and before he could state another sentence, a howl filled the forest by a what sounded like male wolf. 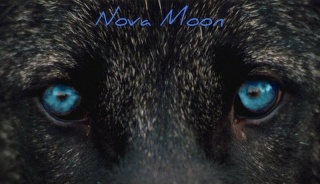 Nova threw back his head and let out a howl to the newcomer telling him to come to his howl for he was busy at the moment. Then he looked at the others waiting for their reveal of their names. Then a curious cub came to him wanting to play before a wolf called to it and the newly named Dean went to the lady wolf. Nova grinned," It's ok. I like babies. Nice to meet you Sorrow, I'm Nova Moon. Lead Guardian." She was interesting to look at with the stripes on her body, but since he knew Bolt he wasn't surprised about her fur. She was pretty though. Notes: love the name calcifer, reminds me of Howl's moving castle. The male's ears returned to the smooth return howl. It called for him to follow the sound. So, he did, though thinking it was unusual for a wolf to be so trusting as to let a complete stranger into the lands without any sort of security. At least it made his life easier. His paws moved swiftly, dodging roots and prickled sticks, until he finally made it to the source of the howl. There seemed an abundance of wolves... and little creatures. The little cub looked like something he would find tasty at dinner time, but he did not feel like questioning what it was. "Hello, everyone. The name is Calcifer." He would leave it at that, wanting to hear more about them before going into details about himself. The wolf was still untrusting of these foreigners. 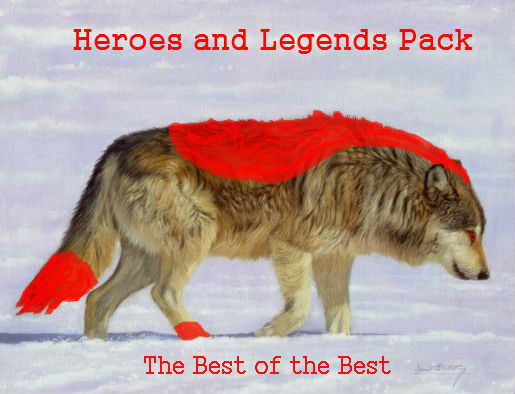 "Hello Calcifer, I'm Nova Moon the Lead Guardian to this pack named Heroes and Legends. Are you needing a home? That's what your howl conveyed anyway." Nova smiled a bit but was somewhat getting upset by the lack of response from the others there. He looked at the female named Sorrow, then to the new male and asked" I would like to ask if you were to stay with us, then what position would you desire to take upon yourself?" He honestly was being nicer then usual, with all these wolves around and the Alpha's here too he would just be looking over their shoulders at the new comers, determining who they were and what they wanted just by watching them. The male was oddly welcoming. 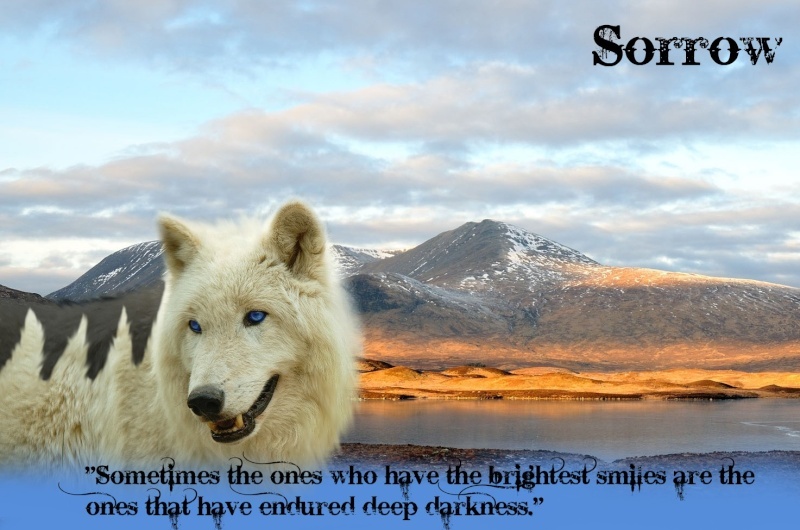 He had never seen in his few years a wolf so kind to a complete stranger on their lands. If it was him they would be put into that submissive role, forced to lay down, asking for acceptance. That was not the case here. His tail lay comfortably at his flank, pointing straight outward. It's not like he was going to completely submit to them. That just simply was not him. "Yes, I am looking for a home, and what my desire for a rank is what ever you find suitable, though a warrior of a sort would be well appreciated." He paused, then taking a step forward and peering into Nova's eyes suspiciously. "Are the stories I hear true? Does this pack hold a power that I have heard from loners for hundreds of miles around?" His amber eyes narrowed in on the lead. He had not yet mentioned anything about that. Perhaps this was the wrong place. He waited for the reply, listening carefully. Nova nodded" There are wolves with one power of their own. I am an ice manipulator meaning I can make ice anywhere and control it." With those words he formed a wall beside himself and Calcifer, granted it was a bit dirty from the forest floor but it was a sheet of ice. "I've had that power since I was small, I learned to fight with it and figure out how to use it to my advantage. Calcifer nodded, impressed, in fact. But he turned his head away, now feeling he could tell his own power, one she may not like. "I also, was born with a gift. I can... persuade. Control one's actions if I so please.."
"I understand if you do not trust me.."
He hoped that it was not the case, that she would see him a threat with the gift he had. But, he would try to use it generously, it was not always the best to force someone against their will. Notes: Sorry it was short, I am packing for the trip. This will probably be my last post for the next five days. Though, I MIGHT be able to post with my phone. We'll see I suppose. Nova tilted his head a bit as he listened to the wolf named Calcifer " Persuasion? So you can tell me to do something and I don't resist? That's scary to know but really useful against enemies. We are looking for all ranks but I think all the lead ranks are taken already. So where do you think you would fit in?" Nova smiled to the female named Sorrow, " What would you like to be Miss?" He then sat down on his haunches with his tail laying to the side waiting for one to respond. Calcifer narrowed his eyes, looking down. "Yes, but I have been turned away by many. They thought... I would try to take charge with the power.. control the alpha." He sighed, and continued suddenly.
" I would want to be a warrior of a sort. my gift helps when I can simply tell some one to atop fighting me." He chuckled, glancing back up at the wolf. I'm lucky I can even get anything out. Also sorry for any misspelled words and such. Sorrow's eyes flicked back as a howl rang through the air, loud and powerful, which made her want to slink lower to the ground, yet she stayed as she was, knowing it wasn't anything like a battle call. She turned her gaze to the male, smiling softly at his words. At least he wasn't angry. She remained silent as he howled back and a new male arrived. She dipped her head in greeting as the new male introduced himself as Calcifer. Sorrow's ears perked forward as Nova Moon asked them both a question, and she took a moment to think before answering. She wasn't very good at hunting or fighting, having never been taught, and she didn't have any skills as a healer, so that left only a few things. "I guess the rank scout, would suit me best." She answered, becoming more relaxed as the time dragged on, seeing as how the wolves there were not being aggressive. The question that Calcifer asked made her slightly confused and also excited. Others with powers like herself? Amazing. She continued to listen as Nova and Calcifer exchanged what powers they had, yet she didn't add to the conversation, rather not sharing what hers was. She was able to manipulate and sense the feelings of others, which she didn't think was anything really special, like ice manipulation, or persuasion. She tilted her head slightly at the question from Nova, opening her jaws to reply, again, as she may have said it too quietly for another to hear. "A scout, since I can't seem to be good for much else." She replied, quietly, eyes darkening for a moment before they lightened again. Dean ventured carefully out from beneath Sorrow, sensing her relaxed attitude, and paused for a moment. When Sorrow gave him a small nod he made a ran with cry, each step more like a bounce as he ventured away, circling back when he almost got out of sight and bolted back, pouncing playfully on the paw of the wolf named Calcifer. Notes: Dean so adorable, lol. Nova nodded to both and replied," So a new Warrior and Scout in our pack. That sounds wonderful!" He then looked at Sorrow hearing that she didn't think she was special," Why would you say that Sorrow? Everyone in this pack is very special. Including you and your cub there. By the way what is his name? " 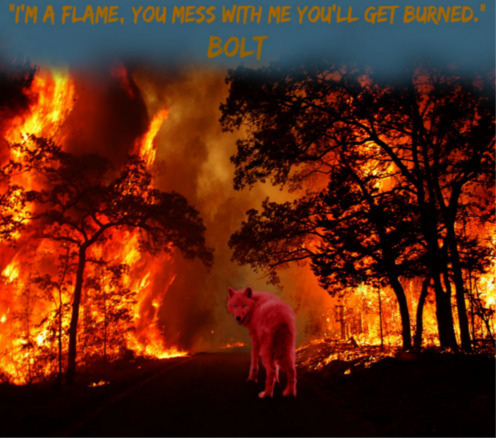 He laughed at the cub on Calcifer's paw and merrily commented on it." He likes ya Calcifer." Calcifer lifted his paw, making the 'cub' roll off. He furrowed his brow darkly and the looked at the others. "Sorry, never was one for younglings. Or small creatures." He asked grimly, changing his expression for an equally unpleasing one. It was dull, emotionless, he just wanted to get on with this process. He also understood that of course they would doubt him at some point , so he would remain tough, although he was always this dull, this emotionless. It wasn't like he tried to be that way, it just was how he is. He liked it, too. The black wolf looks down at her offspring. Small and clueless of the world outside the den, they stumble around the den blindly. Six pups. Two male and four female. She poked her head out and gave a loud howl, calling for the pack, especially Bolt who she hoped was in the area. She looked back in the den and smiled at the pups. Looking back out, she could see flashes of some wolves coats and she hoped they got the message to stop what they're doing and come to the den. The den was small but warm; only big enough to fit her and her pups. The pups were only a few days old. 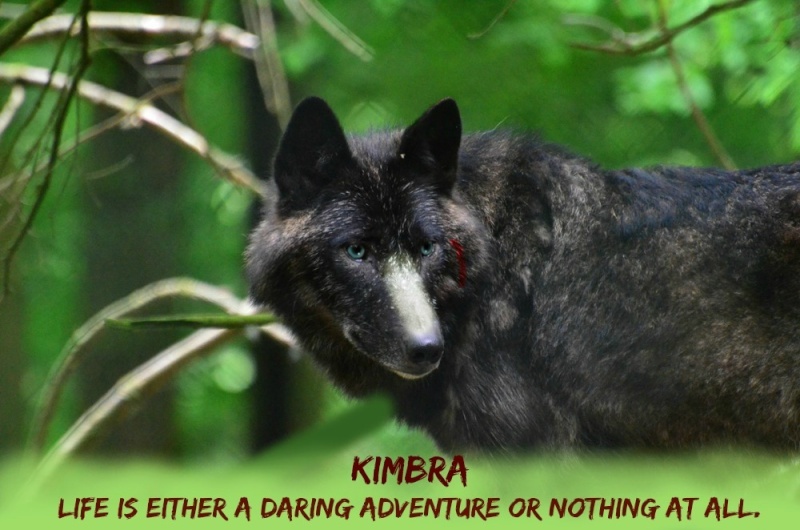 Kimbra had not left the den in that time apart to get food. No one had seen the pups except Kimbra. The six pups were adventurous despite their age. One pup however wasnt as spiteful as the others. The runt of the litter - Alice. She was completely white, unlike the others. No markings. No nothing. The only thing to make her stand out were her bi colored eyes. Ome blue and one yellow. By now, Kimbra was hoping the others had decoded the purpose of the howl. 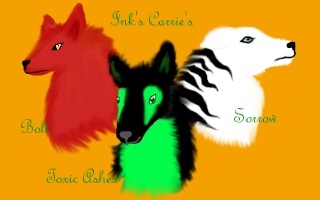 Slowly, Kimbra picked up the pups by the scriff of their neck, two at a time. Two of the pups, Slash and Sasha were identical, both with the same coat, markings and personality that always seem to be near each other. Then, there's Tyler who was climbing over his siblings since birth. Katniss and Amber - two fearless, strong females that were first to venture the den. These were the offspring of Kolt - furture leaders. Notes: I am posting this for Kimbra because her phone will not let her post it herself. The earth beneath her feet grew rough and rocky, the snow disappeared and the freezing temperatures were no longer. A mixture of emotions flooded through her, disappointment, homesickness and curiosity. All of which were fueled by her eagerness to reunite with the wolf she had been in search for since her arrival. The howl had been faint and distant, lacking the information she required to know why such a meeting was being held. Not that that would stop her, somehow she had managed to sneak away from the dark caves. The location of where the pup had traveled was unknown to her, but she could only assume the youngling had heard the howl and retreating back towards the heart of the territory. Whatever had been lurking in the darkness, because there was something there, would just have to wait. The sound of the water crushing against rock drew her attention. Once again carrying her feet off the path towards the female. Not that she could control it, she had always felt a pull towards water. Hiding her power was easy but not while hunger plagued her. Her stomach rumbled, growling internally, in need of the food that she had out off since traveling here. Lily picked up her pace, trotting towards the comforting sound of the cold liquid. It didn't take her long at all by time she reached the river, she had been basically on top of it. Instead of her powers urging her forward, it was her burning hunger. This time, she had no problem giving into her body's need. Her blue green eyes drifted to the water, darting along its depths in search for a golden scale. Taking a step forward, she placed her forepaw's into the water. Ripples were sent out word, alerting the water beasts of her presence. She waited patiently, paying attention to the currents and the way the water flowed rather then sighting the fish. Lily turned her head quickly, the water to the side of her took a dip, creating a hole of sorts that would collect the fish nearby. She drew the water towards her, her eyes following the ball of water carrying four plump fish. Gently, the water exploded off of a flat rock. Her paws latched on top of the first fish, breaking its neck easily, and then continued to do so to the others until all of them were dead. Knowing that she could be on a short time limit she golfed down an entire fish, fulfilling her hunger before picking up the other three fish in her jaws and returning to her journey towards the howl. It was quiet a run before she reached the area to where's the call had come from. A small den stood nearly in front of her. Uncertainty caused her paws to stop their movement, was now a good time to announce her arrival? Should she wait? A smell drifted in the air, one she hadn't smelt in a very long time. The scent of pups, a new life. Despite what she felt, her legs seemed to feel different as they urged her forward. Her eyes immediately feel onto the young female, one who looked as if she hadn't aged a day. The rest of the pups, slowly but surely came into view. They were cute, restless like their mother. Lily kept her distance, close enough to be seen, but not close enough to payed attention to unless one was looking for her. She didn't want to be a burden, not if she wasn't welcomed. The call had been for the pack after all and she was not a pack member. The fish were dropped at her feet, and she sat comfortably, observing from a distance. Bolt moved through the trees at a brisk pace, head held high to keep the pup in his jaws from dragging along the ground. The pup, having recovered from his 'swim' in the slow flow river, squirmed and wiggled in Bolt's grasp, making it hard to keep a hold of it. Bolt finally stopped, a few minutes walk away from where he needed to be, the dens, and set the pup down, huffing in slight annoyance. The pup turned and looked up at him with wide eyes, and any annoyance he had melted. "Are you alright? What is your name? Mine is Bolt." He asked, watching it carefully. It, he, nodded his head yes and opened his mouth to speak. "My name is Benjamin. Thanks for saving me in that river." Bolt gave the pup a warm smile. "Well, Benjamin, it was no problem. It is surely a pleasure to meet you. My mate has given birth to pups, and I need to go to her. I can bring you along, I am sure my mate will not mind another pup in the den." He said, sending a glance in the direction of where his mate was. Benjamin was quiet for a few moments before he nodded. Bolt grabbed the pup by the scruff again and started to walk towards the dens, this time without the pup in his jaws struggling. He made it to the dens, finding the den his mate was located in. The red pelted alpha placed Benjamin in the entrance of the den, sticking his head in and sending Kimbra a soft smile. His heart melted at the sight of the pups, six of them, all seeming to be healthy. He commented, feeling happiness flood him and also strangely protective of the little bundles of fur. He settled down outside of the den, just to the side of the entrance. Benjamin looked inside the den before turning around and laying down beside Bolt and curling up, closing his eyes. Sorrow didn't respond to Nova's first question, not wanting to mention anything about her dark past, but perked up when he asked what the cub's name was. She stated, watching him as he continued the play with the wolf's paw. A soft smile found it's way onto her features at the sight; so innocent the way Dean played, almost entirely oblivious to the threats of the world. Her smile disappeared though when the wolf lifted his paw, sending Dean tumbling. The small cub squeaked and bolted to Sorrow, fur standing on end, looking like a fluff ball. The striped female nosed the cub to calm him before looking back up at the two males, listening to Calcifer's question with a light confused expression. She didn't understand exactly what he meant, but when she opened her jaws to ask a howl shredded the air, loud and close by, a command laced through it. It said to come, and being the submissive, order following wolf she was, she started moving towards the sound, body low to the ground, ears pinned against her head. Dean followed close on her heels, though he was bouncing along instead of slinking low to the ground. Sorrow noticed that the howl came from a den in the camp of the pack who she had yet to know if she had been accepted in. She saw a red pelted male by the entrance to the den, and from inside she could hear the whimpering and cries of newly born pups. She stayed far enough to observe but not be a bother, near a white pelted female, yet Sorrow didn't speak. She stayed quiet, not bothering the wolves in the area. Dean, on the other paw, wandered away the moment Sorrow had settled down, bouncing over to the white pelted female, much to Sorrow's displeasure. Dean had a grin on his face as he stopped beside the white pelted female, not noticing the look he was shot by Sorrow, a look that mostly mother wolves gave to misbehaving pups; stop it and come here. After a few moments she laid her head on her paws, turning her blue eyes to the den. 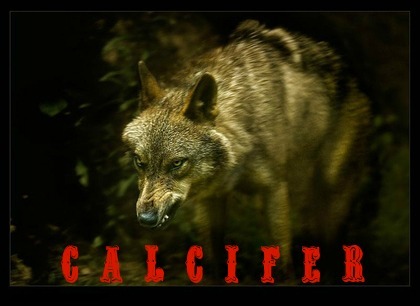 Dean said to the white pelted wolf, glancing down and seeing the fish the wolf had. He asked, curious as ever. Nova followed Sorrow but did not have his head down or acting submissive, he watched Dean run to a white wolf in the distance as he stood beside Sorrow. The white female was Lily he realized, he grinned a bit but then formed a frown as he neared the den where Kimbra's voice had been heard. In front of the den was 6 healthy pups. This took Nova aback in surprise, one that Bolt had not been here for the birth and two that he was not asked to accompany her to the dens and stay as a guard. "Kimbra? You there?" he asked as his frown disappeared and a grin took its place as he looked at the little ones. As the father of the pups came rushing to Kimbra's aid she couldn't be more surprised and a tad disappointed. She would go as far as saying she was beginning to enjoy her time around the male, but she was willing to accept his presence before, but now maybe not. He had missed the birthing of his own pups. She huffed in annoyance, what kind of father would he be if missed something like this? There were 6 of them, there was no way female could raise the young one's on her own, he would have to step up one way or the other. Not that she had much room to talk, get mere presence was not yet welcomed nor known by the new mother. She was arriving unannounced, uninvited, and her timing couldn't be worse. Her eyes flicked to the side of her at the sound of approaching footsteps. It was another female responding to the call. Instead of continuing forward, however, she stopped and took a seat next to her. Lily couldn't help but wonder why she wasn't approaching the den and why she had chosen to sit next to her out of all the locations in the territory. She had kept her distance for the sole purpose of being alone. Yet, some obviously didn't receive the message. Luckily enough, the wolf beside her remained silent and reluctantly she did as well. 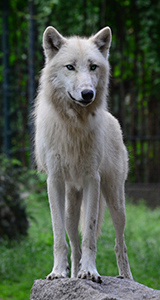 The familiar sight and scent of a male wolf came into view, one that she placed with the one and only Nova. A wolf that had been gentle and kind when given every reason not to. Her eyes followed him as he approached the den confidently before calling for the female. Personally, she would have never walked up to a den of newly born pups. But that was her, and she was unaware of the relationship the two wolves had. "Did you catch those?" a young voice piped up infront of her. She blinked, straightening her posture as she looked down at the small creature. Never in her life time had she seen such a small animal. The only thing she could come up with was that it looked like a combination of a hairless cat and a rat. Matter of fact, if she hadn't just eaten should might have considered enjoying a snack. Lily flicked her tail, unsure why the being had approached her so confidently. Yet, since doing so it had spoken a question, one she believed it deserved the answer to. She nodded in response before opening her muzzle , "I did." her tone was hushed, brushed away by the ongoing wind. The red pelted Alpha approached the den. Kimbra with her head just poking out of the den smiled. "They look beautiful." he said. Kimbra nodded. She put her head back inside the den, still watching the six young ones tumble about. The black male, Nova Moon approached. "Kimbra? You there?" Nova Moon said, looking at the six pups, also looking at Bolt quite strangely. Kimbra looked back out the den again. "Yes?" she replied wondering what he needed. A smile reached Nova's face as the pups crawled around his paws. A few wolves had gathered around the area, either near the lake or talking amongst themselves. Kimbra couldn't help herself from smiling, both at Bolt and the pups. Tyler seemed stubborn however, even with his eyes closed. Turned away from the others and sitting still, he seemed quite arrogent. Which somewhat reminded Kimbra of herself as a pup. "Why did he just ditched us?" "I dislike her because she doesn't take care of her responsibilities." "An Alpha needs to take care of his or her pack before thinking about having pups." "I suppose we are." "He was being called." Unknown replied to Colossith, shaking her head slightly. "Like we're being called." She wasn't too sure why he was upset/unhappy about it, he had said that he had to go so Colossith couldn't be mad at Bolt. She listened to him talk about why he didn't like the pack leader, she frowned a little then shrugged. "You don't have to like everyone." That was true, there was no law saying they had to like the alphas. "Perhaps it was a surprise to her." She felt like he was angry over nothing, but she didn't want to bug or say anything rude. She frowned a little, she kept padding until she came into the clearing with the den and alphas. She could smell the pups, there were a few. She smiled a little, turning towards Colossith. "Pups are cute, but they bring in extra security measures..." Which meant her patrolling more and making sure the area is safe.